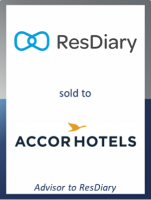 GCA Altium acted as exclusive financial advisor to ResDiary, a provider of online restaurant reservation software, on its sale to French-listed global hospitality group AccorHotels. This is the latest in a series of hospitality technology transactions led by GCA, following the sale of Guestline (hospitality software) to The Riverside Company and the Series B and C financings for TouchBistro (iPad mobile point-of-sale technology). The ResDiary transaction follows a number of high profile tech deals for GCA with international strategic acquirers – in the last 24 months GCA has closed transactions with acquirers including Google, Verizon, ADP and Amazon. ResDiary is a leading software as a service (SaaS) platform for restaurant reservation and table management, used by over 8,600 venues across 60 countries and seating more than 160 million diners a year. The Glasgow-based company, founded in 2004, provides hospitality venues with a high-end table management solution that optimises food and beverage revenues whilst controlling operational costs. The software is used globally and the company’s customers include TGI Fridays, Loungers, Sapporo Teppanyaki and over 35 Michelin star restaurants. Adrian Reed, Managing Director at GCA Altium, said: "ResDiary is a real UK SaaS success story. ResDiary has a differentiated proposition which resonates with its customer base, reflected in the Company’s rapid global growth and outstanding SaaS metrics. It has been a pleasure working with the ResDiary team and in AccorHotels they have the ideal partner for future growth." Mike Conyers, ResDiary Co-founder and CEO, added: "We have had a very successful relationship with AccorHotels in Asia Pacific, and all the ResDiary team is thrilled to join the Group. We are looking forward to expanding our service on a more global level with AccorHotels."